...this arrived the other day. Needless to say, I’m in love! I paid way more than I should have (read: significantly more than $0), but I couldn’t help myself. These don’t come around too often, and it’s in really nice shape. You may consider me a Gateway2000 Fanboy (if there is such a thing). 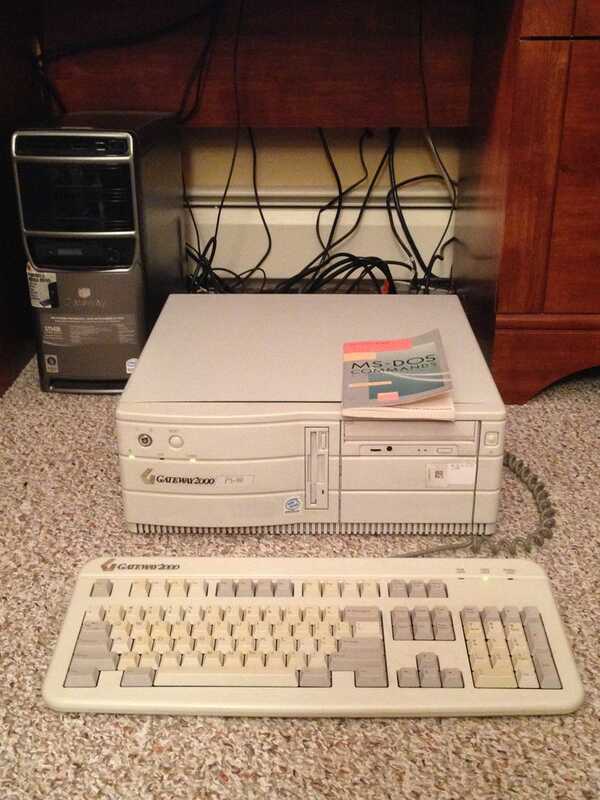 The specs: 90mhz Pentium 1, 16mb RAM, 1GB Connor HDD, ATI Mach64 4mb graphics card, Creative SoundBlaster CT2230, 3Com Etherlink III, and a Gateway2000 branded US Robotics Modem. It’s currently running DOS 6.22. This is now my second Gateway2000 PC (the first being the tower). Both are running great. I’m thinking of moving some RAM over from the tower, and installing Windows 95 on the desktop. I’m already running DOS 5.0 and Windows 3.1 on the tower, and I don’t need two computers running the same setup.